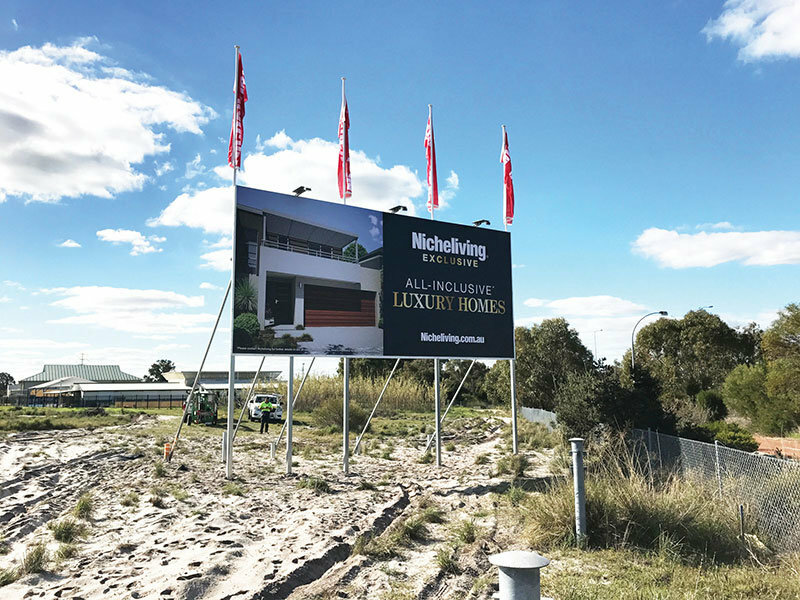 Nicheliving commissioned us to produce a billboard at their Willetton development to capture the attention of vehicle traffic on Roe Hwy. Our brief was to maximise marketing impact and exposure in this key location. Using their standard 6 x 3 billboard size, we added flag banners and solar lights to draw attention and create 24hr exposure. A particular obstacle faced was the soft terrain that presented some challenges in terms of installing the framework. Nearby shrubs also impeded some visibility. When the need arose to change the marketing message we worked with Nicheliving to extend the billboard size to a 9 x 4. The outcome is a MASSIVE billboard achieving huge visibility and eye-catching attention in a high traffic location. We love to collaborate with our clients. Get in touch and together we’ll turn ideas into reality.